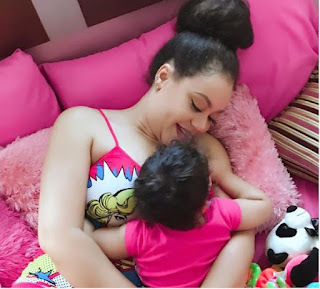 Nadia Buari today warmed her way into the hearts of her social media fans with appealing photos of herself in the comfort of her bedroom. Naddy in another picture was seen cradling her child as she rocked a skimpy outfit which left majority of her skin in public view. The pictures have since hijacked major headlines on gossip pages, including this.. The 35- year old has enjoyed a successful acting career thus far. She received two nominations for Best Actress in a Leading Role at the African Movie Academy Awards in 2001 and 2009.